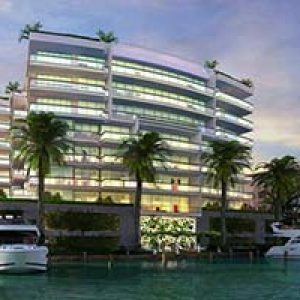 Vela Vista is a gorgeous 4 story tower located in beautiful, sunny Fort Lauderdale. Located at 1531 Southeast 12th Street, and nestled in the lovely community of Rio Vista, it boasts a luxurious and spacious 10 units available for future residents. Ranging in size between 1761 square feet to 2609 square feet, prices range up to $1.6 million to own. They are available in 2 and 3 bedroom floor plans, and offer a promise of exclusivity with the small amount of units available. Each unit comes equipped with a wide and open terrace or balcony with a gorgeous waterfront view. The impact resistant floor to ceiling windows help with these unobstructed views and allow light and air to flow into the unit. The gourmet kitchens have Samsung quartz kitchen countertops with decorative backsplash, and the hand crafted cabinets have soft lighting and “soft close” technology. They also come with modern stainless steel Viking appliances. Each unit has a Whirlpool washer and dryer, Fabrica carpeting, and recessed lighting throughout the entire living space. Master bathrooms have free standing and relaxing soaking tubs with frameless glass enclosed showers, as well as stone slab countertops, Kohler fixtures, and floating glass vanities. The bedrooms each have walk in closets for the resident’s convenience. The property boasts a high tech computerized security control system as well as a computerized privacy gate, ensuring safety and comfort. There is also a dock on site, and it can hold vessels up to 38 feet in length, allowing one “boat slip” per unit. Residents will also have access to secured parking, two dedicated parking spaces, and secured storage lockers. The heated swimming pool with expansive sundeck is perfect for entertaining, and is also Wi-Fi accessible for those who need it on the deck and in surrounding areas. The carefree nature of Vela Vista is magnified by the convenient amenities available to all residents. Directly south of Vela Vista is Southport hopping Center and the Harbor shops, offering endless shopping and dining opportunities for residents. Located just moments from the Fort Lauderdale Hollywood International Airport, the property is situated perfectly between the water and the bustling activities. There are multiple banks, gas stations, and drug stored within a five minute drive of the property, promising convenience for everyday needs. These units will not be available for long, and there is a limited quantity available. It’s vital to express interest as soon as possible to ensure your place in luxurious Vela Vista.